1. Take 5 minutes to write down everything you dream of accomplishing. This is a no holds barred, free form stream of thought. Just let it all out, every dream you wish you could achieve. No dream is too small and no dream is too big. It can be something as simple and vague as being a better mother, to something concrete and difficult such as becoming an Olympic Champion Gymnast. Make sure you only use 5 minutes as that will capture your key dreams and your list won’t be so broad that you are overwhelmed. Do this step NOW! Do it before moving to step two of the exercise. If you look at the rest of the steps before finishing step one, the exercise won’t be as valuable. 2. Ok, now that you have your list, make three columns next to the items. In the first column, rate each item on an importance scale of 1 to 10, with 1 being not that important and 10 being extremely important. You can use a number more than once since you most likely have more than 10 items. In other words, there may be multiple sixes or multiple fours, etc. 3. In the second column, rate each item on an achievability scale, with 1 being extremely difficult to achieve and 10 being extremely easy to achieve. Note: You may want to create a 1 to 20 scale for step two and three depending on the number of dreams you have listed. The largest the list, the better off you will be with this larger scale. 4. Add each row and use the third column as a total for each dream. 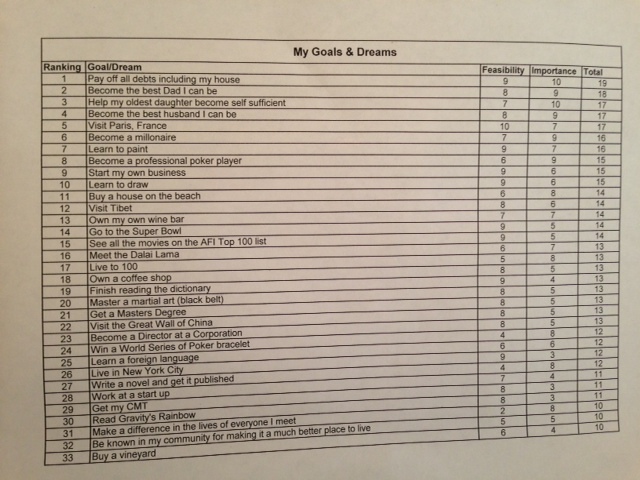 For example, one dream may have received a 4 on the importance scale and a 6 on the achievability scale. So the total score for that dream would be 10. 5. 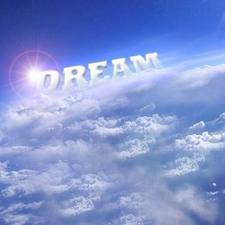 Once you have a total for each dream, order them from the highest score to the lowest score. If you happen to have two that received the same score, then review the two and decide which is most important to you. Some of you may scoff at this idea and think it is too systematic. I totally understand and this exercise is not for everyone. This exercise may not even help you decide which dream to tackle first. The exercise should help you focus your energy if you get stuck or are not sure which dream to start with and which initial actions to take. Of course I have a lot of ideas for creating a road map for each dream but I will reserve those ideas for another time. Until then… Smile Big and Dream Bigger!